Students looking to become surgeons need to complete a surgery residency program before they can be a professional doctor. There are many different types of residency programs for surgeons, from cardiothoracic surgery residency to vascular surgery residency programs and everything in between. While there are many different surgical specialties, there is one thing that all of these residency programs have in common, they are all very competitive and challenging to get into. This is why when applying to any surgery residency program it is important that you have an application that stands out, and most importantly a general surgery residency personal statement that really shines. We know how important this is which is why we offer professional help with this process. Creating a quality residency personal statement for a surgery residency program that will help stand out and get noticed among admissions boards requires a number of things. Writing personal statement for residency can be a challenge as you not only need to make sure that your essay is well written, interesting to read and free of errors, but it needs to be applicable to the program you are applying to. For example, if you are applying to a pediatric surgery residency program in one place and an orthopedic surgery residency program somewhere else, you will want to have different personal statements; one for the pediatric and one for the orthopedic surgery residency programs. The statement needs to not only show your ability for success as a surgeon but as a surgeon in the specific program your applying to. Massachusetts General Hospital: this program offers an opportunity to gain a huge amount of experience in your field with most residents performing 1000 and 1200 surgeries within their time on the program. John Hopkins University: their aim is to train the future leaders in surgery and they will provide you with all of the experience you will need to achieve it. University of Pennsylvania: this is a superior 7 year residency program to which you will apply through ERAS as with most other programs. University of California san Francisco: this program welcomes some 79 clinical and 14 research residents each year to train across a wide range of different specialty areas. Duke University School of Medicine: this program offers a full range of general and specialized surgery places to give you the experience you are looking for. University of Michigan: with more than 70,000 operations conducted this program offers a huge amount of experience as well as a 100% acceptance rate for those going into fellowships. What Do You Need to Include in Your Surgery Residency Personal Statement? Why do you want to work in surgery and the specialty that you have chosen? What training have you already undertaken in your chosen area? What is it that will make you an excellent surgeon in your chosen field? Where do you expect your future career to take you? What are your reasons for applying to this specific surgery residency? A successful surgery residency personal statement requires a number of components, making the process difficult for many aspiring surgeons. This is why we have a team of professional writers on our staff that can help you create engaging personal statements that are interesting and well written. We also have writers with different specialties and who understand the surgical residency programs so even if you need a very specific vascular surgery residency program essay, we have someone who can write it for you. Creating a surgery residency personal statement that will help you get accepted into your school of choice can be tough, but when you turn to us the process has never been easier. Whether you need a new essay written entirely or you just need a little help improving your current essay, we have someone here to help you. Delivered to you on time: we always provide a quick turnaround and will meet your expected date. Full confidentiality: we will never share any aspect of your application or your details. Error-free: we provide you with free proofreading so that you will know the work is free from mistakes. Totally original: your statement is written to your needs and tailored to you as well as being delivered with a free plagiarism report. Full satisfaction: we offer unlimited revisions to ensure that you will get precisely what you are looking for, if however, we cannot achieve your satisfaction we will offer you a refund. 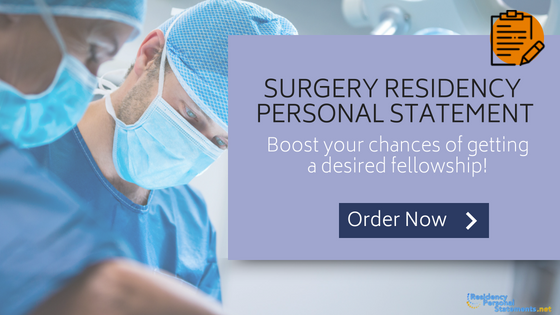 Make your surgery residency personal statement shine with the help and support of our professional application writers and editors.